Based on reviews from 1,704,869 users. 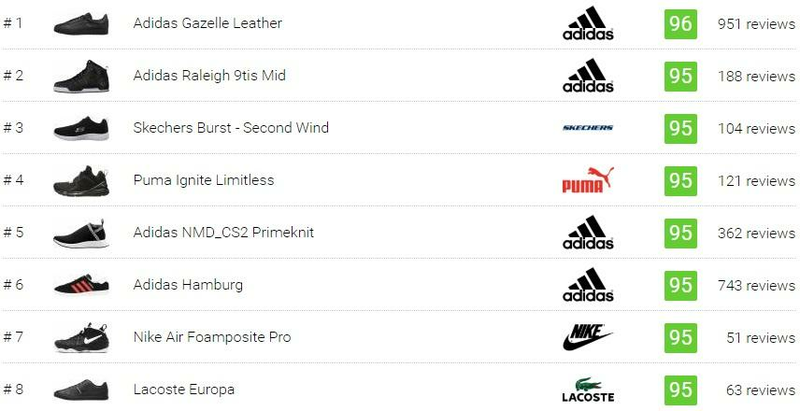 Learn how our rankings work or see our guide to black sneakers. Updated Apr 2019. A sneaker's colorway has always been an integral part of a particular shoe release's success and reputation. In the culture of sneaker fandom, there are two distinct colorway categories where kicks could fall under: vivid or striking and subdued or neutral. Although shoes in bright colorways go down in history as some of the most notable, kicks with refined and subdued tones prove to possess greater longevity and timelessness. And what's more subdued than the ultimate neutral and darkest color of them all – black. The color black is many things – stylish, universal, and a classic – and what better way to add a touch of black to your ensemble than by your shoes? We made this ultimate guide on what black sneakers are, its different types and styles, why you should get them and, of course, how to style them. Almost every shoe model has been released in a black colorway. Maybe it's because of the color's versatility or its time-tested selling appeal amongst consumers but whatever it is there's no doubt that every person who owns a pair of sneakers would have at least one black kick somewhere in their collection. Here are some of the most notable black shoes that, in one way or another, have left a mark in sneaker history. 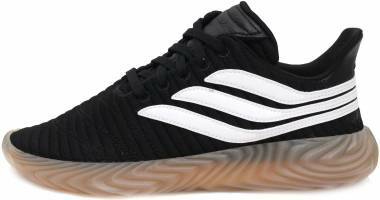 Samba OG – An indoor soccer shoe that's said to be the brand's second-highest selling pair next to the Stan Smiths. Although it has been released in other colors the original black with three white stripes and tan gum sole are by far the most sought after. Moreover, the shoe had made appearances on the silver screen, in movies such as the Transformers and Trainspotting. 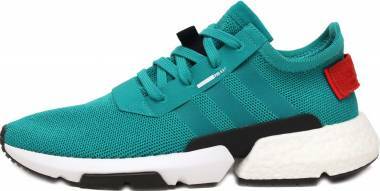 EQT Support 93/17 – Released in an era of bold silhouettes, vibrant colorways and gimmick-filled shoe designs, Adidas decided to take one step back by introducing this shoe. Purposely stripping away the unnecessary, the EQT Support 93/17 exuded a classic and timeless look that consumers found refreshing. It also introduced the EQT's now iconic signature colorway of black/sub green/white. Gazelle – Although initially released in a red and blue colorway the training-inspired Gazelle's black version is its most popular today. Its ability to match with any ensemble and the stark contrast between the upper and the tongue are probably some of the reasons why many favor the black colorway. NMD _R1 – One of the most popular silhouettes today, this kick is favored for its comfort and stylish design especially the black/blue/red colorway. Some contribute its success to its perfectly balanced concept of modern style with a comfortable fit. Yeezy 350 Boost – Who would forget this Kanye-led collection? With all the hype, long store lines, and unbelievable reselling prices of the Yeezy 350 (and other models in the range), it is common knowledge that it is one of Adidas' best achievements recently. Blazer – This retro sneaker was a basketball shoe that was first worn by George "The Iceman" Gervin. Adapted later on by skateboarders for its excellent grip, it continues to stay relevant today due to its timeless style, recognizable silhouette, and adequate comfort. Air Foamposite One – Aside from the "Royal" colorway, the "Blackout" is also one of this kick's best selling colorways. Inspired by a fighter jet, it is the first sneaker with an upper made entirely from a one-piece synthetic material. Air Yeezy – Apart from the controversy surrounding this partnership, the Air Yeezy is notable as it is the brand's first non-athlete collaboration (and a very successful one at that). Moreover, the unconventionally-designed Air Yeezy, with the help of Kanye's fame, made it as one of the most coveted pairs by sneakerheads. 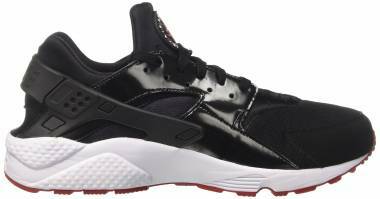 Air Huarache – This running classic got rid of the unnecessary and added an unconventional outer cage that provided support and a secure fit. Black colorways are preferred for its simple yet futuristic appeal. Air More Uptempo - The eccentric Air More Uptempo, a former basketball shoe, is made famous by Scottie Pippen and appeared in the movie George of the Jungle. Suede – Even after decades since its inception, the Suede is still a mainstay in today’s sneaker culture due to its timeless style and historical relevance. SK8-Hi – Based on the Old Skool's design, this shoe aimed to provide more support and stability to skaters at the time of its release. BMX riders for its grip and punk rockers for the kick's countercultural representation also prefer it. Old Skool – In recent years the brand’s first skate shoe experienced a massive resurgence in pop culture. Thanks to musicians like Frank Ocean and Tyler the Creator the Old Skool became an irresistible shoe that would get sold out as fast as it is restocked. Speed Trainer – The luxury brand's take on the sock-like Speed Trainer and form-fitting trend was taken a notch by literally attaching a knit sock upper to an outsole. It received mixed reviews but it didn't stop the hype surrounding the shoe. 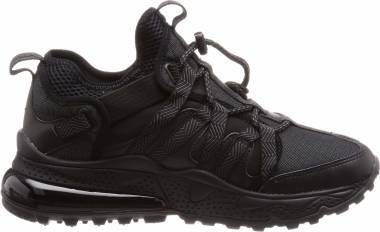 Triple S Trainers – A hybrid of the chunky and dad sneaker trends, the Triple S Trainers is a bold kick that also garnered mixed reactions from consumers. 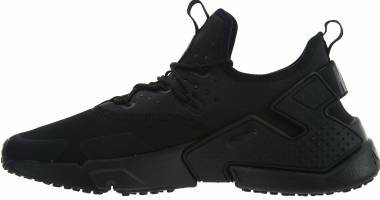 Triple black and black colorways are preferred by avant-garde sneakerheads who want a subtler pair. Chuck Taylor All Star – This shoe's design remains mostly unchanged since the day it was released. As a result, the original black colorway has reached an iconic status that most sneaker brands recognize. Jack Purcell – With a rich history that goes back to the 1930s, this shoe remains as a classic staple in every sneaker fan’s wardrobe. Classic Nylon – Grounded in the Classic Leather’s design, this pair is crafted from a lighter and more breathable nylon material. It is best known in the black colorway. Ex-O-Fit Hi – First released in both white and black colorways, this shoe is one of the first sneakers to feature a Velcro strap. It is best known as the go-to footwear during the 80's boom in fitness and health. Son of Mars – Just like the Spizike this pair is also a by-product of Spike Lee's involvement with the brand. It took inspiration from Jordans 3 to 6 and 20. It is best known in the black / cement and Yeezy Black colorways. One - Before the brand suffered losses skaters were looking toward them for reliable and stylish skate shoes. 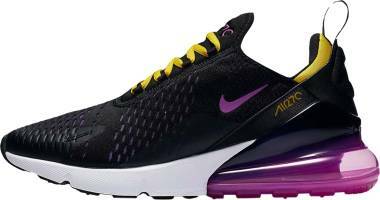 The Airwalk One was a notable kick as it went against the 90's loud and vibrant designs. It featured a lighter and more streamlined silhouette, which completely changed the sneaker game during that time. Jazz Original – Known for its excellent comfort and timeless style, the Jazz is a staple pair in both the sneaker world and sporting history. Skytop – Manufactured as a skate shoe, the Skytop's design is inspired by the Air Jordan Legacy. Skaters warmly welcomed the kick, but it also caught the attention of different men's style publication and appealed to musicians like Lil Wayne, Jay Z, and Kanye. At its relatively young existence, this kick is already considered a classic, at least in the skate scene. Even if they all look the same at first glance, believe it or not, there are plenty of varying features that need to be considered when choosing the correct pair of black kicks for you. Each black sneaker is different – the shape, fit, character and benefits are all unique to each model so finding the best black shoes will take some deliberation. Here are some things to consider for your next purchase. A sneaker's collar height could have a significant influence on how it fits, its comfort, and style, so it's essential to get to know each type. This is the most common and preferred cut out of the three due to its simplicity, lighter weight, and cheaper cost. Examples of these are Skechers Burst – Second Wind, Adidas Hamburg and Vans Atwood. This cut is the second most popular when it comes to availability. It is preferred by many for its added ankle support, secure fit, and visual appeal. Examples of black mid-top shoes are Adidas Raleigh 9tis Mid, Reebok Workout Mid and Nike Air Force 1 UltraForce Mid. Black sneakers in this cut are the least manufactured out of the three. It typically costs more and weighs heavier. Despite this consumers opt for a pair of high-tops for its eye-catching silhouette and added protection and warmth that makes it ideal for colder seasons. Examples include Adidas Yeezy 750 Boost, Nike Air Foamposite One and Puma Sky II Hi Nubuck. A sneaker's comfort, durability, fit, price, and function can be greatly associated with its upper's material - better materials generally equate to higher price point. Moreover, different materials offer varying styles and textures that give your black sneaker its character and distinct look. Having said these, knowing the different fabrics used may benefit you in your next classic sneaker hunt. Canvas. It is one of the first materials used on a shoe. Mostly preferred for its lightweight and breathable fit, canvas shoes make for ideal summer footwear. However, it does not offer much support and is prone to getting wet. Converse Chuck Taylor All Star and Vans Authentic are some of the well-known kicks that have a canvas upper. Leather. 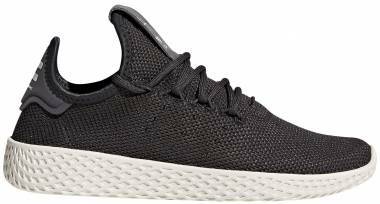 This material was used in creating the first-ever athletic shoe and has since been a favorite due to its durability, sleek appeal, and its ability to shape itself to the wearer’s feet. It is important to know that there are several types of leather. The man-made or synthetic leather is commonly seen on low- to reasonably-priced black shoes, while shoes crafted from top-grade leather are offered at a more expensive price tag as it features enhanced comfort, durability and aesthetics. Nike Air Force 1 07 and Balenciaga Arena Low are a few examples of shoes with leather uppers. Suede and Velvet. Although made from two completely different materials both suede and velvet display a fuzzy characteristic and feels soft to the touch that adds luxury to the shoe's and wearer's styles. These materials are favored for its stylish look and durability. New Balance 1978 and Fenty x Puma Velvet Creeper are some excellent examples of shoes with these fabrics. However, its downside is it takes extra steps to maintain its pristine condition. Mesh or Knit. 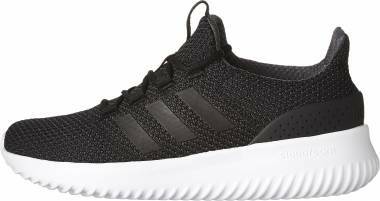 A product of today's modern technology, engineered mesh and knit-crafted sneakers dominate the market as they provide a one-piece upper that is breathable, lightweight, and supportive. Aside from these, modern sneaker fans prefer this type of material for its streamlined silhouette and its sock-like fit that allows freedom of movement. Saucony Grid 9000 Knit and Skechers Elite Flex – Hartnell are a few of the many black sneakers that come in a mesh or knit upper. Vegan / Recycled. 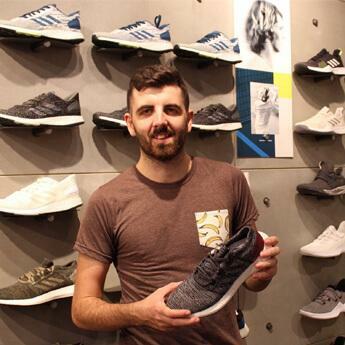 It might not be on everyone's list of criteria when looking for their next black sneaker purchase but environmentally conscious consumers are steadily rising, and it is a good thing. Going for an eco-friendly pair is a great way to make a difference. Apart from looking great, your purchase also aids in reducing pollution and saving animals. Onitsuka Tiger Ultimate 81 and Saucony Jazz Low Pro Vegan are some of the eco-friendly sneakers available in the market. Decorated black shoes are an excellent way to express creativity, amp up an outfit, and stand out from the crowd. Here are several adornments you could find in the market to help you choose the next addition to your shoe collection. Studs / Sequins / Glitter/ Beads. Depending on which you prefer, these offer different personalities to the table. Studs provide a punk rock and rebellious attitude, while sequins, glitter, and beads generally exude a fun, girly, and glamorous vibe. All of which are eye-catching. Check out the Puma Basket Heart Glitter in Black / Silver and the Converse Chuck Taylor All Star Velvet Studs Hi for ideas. Straps. Be it Velcro or elastic straps, they add something unique to a black sneaker's overall style. Its aesthetic appeal comes second as they are used as a replacement for lace-up systems or to provide a secure fit. Examples are the Adidas Superstar Slip-On and the Vans Old Skool V Pro. Metallic Accents. A pop of sheen could instantly add a completely new and refreshing take on a classic black sneaker’s character. It adds a touch of modern charm and brightens up a pair of black sneakers. Take Adidas’s Superstar 80s Metal Toe in Core Black and Nike’s Air Max 90 Ultra 2.0 Flyknit Metallic Gold. Embroidery / Patches. What better way to jazz up a pair of black kicks but with colorful patches and embroideries? Show off your creativity and personality with different themed images. Let flowers show your sweet side or opt for wild animals such as tigers and snakes to add fierceness to your outfit. No matter your preference these appliqués are sure to make you stand out from the rest. Try Gucci's Ace Embroidered sneakers in black or opt for Kenzo's Slip-On with Patches for a fun and youthful look. Zippers. Ditching shoelaces entirely or just acting as an aid for easier entry, these metal-crafted zippers add futuristic flair to any shoe. Just take a look at Y-3's Stan Zip and Nike's Blazer Advanced. Heel / sole style. Variations of heel heights and sole adornments are available to keep the black sneaker interesting. Platforms and hidden wedge heels offer added height, while speckled midsole, gum sole, "iced" sole and many other sole styles add a touch of stylish detail to make the pair unique. Peep at Adidas’ City Cup and Nike’s MD Runner 2 LW for examples. Although some may dismiss black as a sad color, more people prefer it because of its numerous advantages. Black sneakers, specifically, have proven to be a favorite amongst sneaker fans. Here are some reasons why. You never have to worry about matching. The black sneaker's achromatic color goes well with any and every other color. So it is certain that it will look great paired with any outfit you pick. Hence, you also save precious time trying to decide. It camouflages stains and dirt. Being the darkest color of all, black can hide unwanted and unexpected dirt and stains. This means you don't always have to labor through constant sneaker cleaning. Flatters any style and personality. Whether you're into minimalist styles or sporty looks, girly or punk rock a pair of black sneaker will complement it. Take the Converse Chuck Taylor All Star for one it looks great paired with girly dresses or with skinny jeans and a hoodie. Works well no matter what season. The black sneaker's versatility not only applies on outfits but also extends to the seasons. People are constantly seen rocking black kicks even in summer and spring because of the ease it brings when it comes to pairing. Instantly pulls an outfit together. No matter how busy your outfit looks, the color black has the ability to balance it out and make it look put together. Endless choices. Almost every shoe model has a black iteration, which means that you can choose any sneaker style or design and find it in a black colorway leaving you with an endless amount of shoes to choose from. It could easily be dressed up and dressed down for various occasions. To some extent, black shoes possess elegance so despite its sporty silhouette it could be easily paired with dressier clothes for special events. There are a number of techniques for cleaning a black pair, and it all depends on which material your shoe is made from. Below are tips on how to go about cleaning your sneakers. Leather – First get rid of debris and dirt by dusting your shoe with a soft brush then use a soft cloth and toothpaste to take out any stubborn scrapes and abrasions. If you want to make your pair shine then you can apply shoe polish. Finally, to protect your leather sneakers special oil can be applied with a soft cloth to keep it from drying out and cracking. Suede – Use a soft brush to gently remove dirt or a stronger bristled brush to remove scuffs. To remove stains, you can use a pencil eraser. Do not use water to clean suede and if your shoes ever get wet sprinkle talcum powder on them and let it soak it up. To protect your suede shoes, you can use a protective spray formulated explicitly for suede fabric. This can help prevent stains and discoloration. If your black sneaker has faded, then using a special suede shoe dye should be applied liberally with cotton wool. Canvas – Dilute a small amount of laundry detergent in water then saturate a toothbrush in the mixture and start brushing to remove any marks or stains. Once completely clean let it air dry. To protect against the elements, you can rub your black canvas sneaker with beeswax and use a hair dryer to make it melt into the fibers. To protect it from stains and dirt a fabric protector spray should be applied. Just like suede, when your canvas shoe has faded a special shoe dye specifically made for canvas should be applied. Make sure your black sneakers are clean before dyeing it. Both these colors are neutral, timeless and universal. Choosing between the two depends on the individual's preferences. Some say white is better because it's brighter and looks better with casual outfits while some are more inclined to the black ones as, according to them, they are more practical because dirt and stains camouflage into the shoe. So, pick according to your inclination because both essentially have the same advantages. Heels and dress shoes are common footwear you'll see in the office, but let's be honest if everyone had the chance to choose they would pick sneakers to work. Why? One thing – comfort! One thing to consider, of course, is the nature of your work environment. Creative workspaces allow more lenient dress codes while corporate offices probably won't tolerate it. Another thing is making sure that your sneakers are not the workout/gym type. Lastly, your black sneakers should not look too beat up for the office. Clean, black shoes are the most befitting for the office as it provides a more mature and serious look and they are subtle enough to go unnoticed if you're rocking a dressy outfit up top. Here are some outfit tips you can try for the office. If you're trying to land an office job, your attire for the interview will require a little bit of effort than the usual casual sneakers. Even though many workplaces are becoming much more lenient about their dress codes, a professional appearance, especially on the day of the interview, is still of utmost importance. A big part of getting the job is making a good first impression, and how you dress for the interview plays a significant role in creating a great first impression. And this includes your shoes! So opting for the more traditional heels and dress shoes for the interview could work greatly in your favor. Clean black sneakers with a sleek style and leather upper could pass as semi-formal footwear. As long as you style it appropriately for the setting, your black kicks will work great for your first date. If you're a guy and the date is in a fine dining restaurant then pairing your triple black sneaker with black socks, tailored trousers and a blazer should do. Weddings are fun occasions that provide an excellent opportunity to dress up, and if the ceremony is being held outdoors, it's more than probable that it is summer. For the ladies it is best recommended to opt for footwear that is dainty and airy. It does not have to be heels it could be a pair of strappy sandals or metallic flats. As for the men, a more casual but decent pair of black sneakers paired with a suit is acceptable. The sandals are not the only footwear of choice for summer. Stylish sneakers are also practical as it is still breathable and offers more protection than sandals. Although bright colored sneakers are more prevalent during the summer, black sneakers are also a mainstay in the streets during this season. Aside from its comfort, people prefer black sneaker for its ability to make an outfit more chic or edgy depending on your ensemble. Moreover, travelers favor it as it effectively conceals dirt and stains making for a fuss-free journey.